Every organization needs to keep handy sample employee warning notices. The management serves these notices to employees on conduct or performance issues. To make it easy, we have drafted a wide range of ready to use employee-warning notices. The Notice Forms are absolutely free of cost, easy to download and also available in a wide range of convenient formats. From sole proprietorships to large multinational firms, organizations of all sizes will find the notices extremely useful and handy. 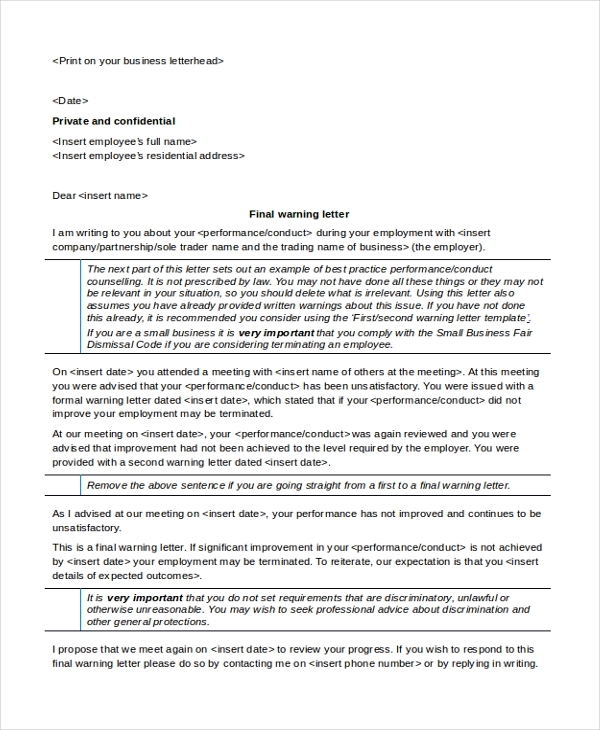 The final warning notice to the employee is an easily editable and Word format sample. The user can add details of the name of the employee, name of the firm and employer, details of the employee’s poor performance and other relevant information. 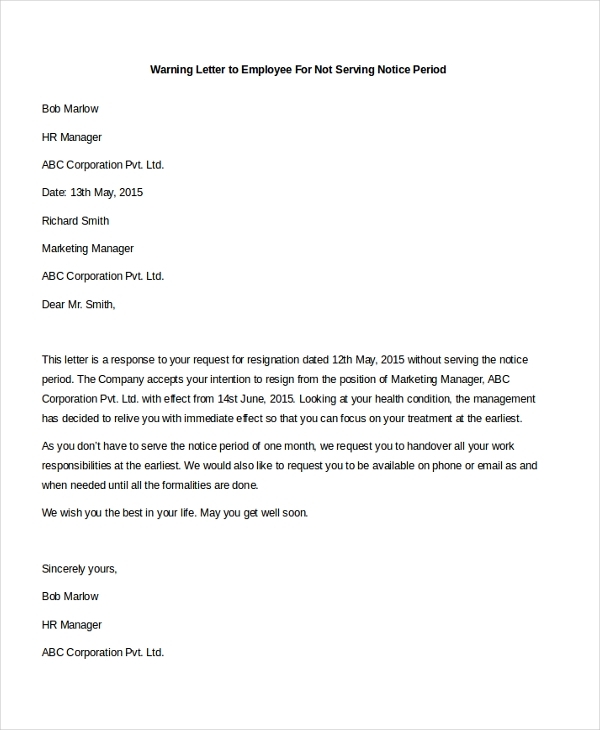 The HR manager of a medium or large sized firm can use this sample letter to give a warning to an employee who hasn’t served his notice period before submission of his resignation letter. The firm or employer can serve this warning notice to those employees who have taken a leave of absence without informing the necessary authority. This template is available in Word format and is easily editable. You may also see 30 Day Notice Forms. The restaurant employee warning notice is a PDF format notice. This template has space for the user to fill in details of the employee, reason for poor conduct, details of the deadline and follow up meeting and other information. 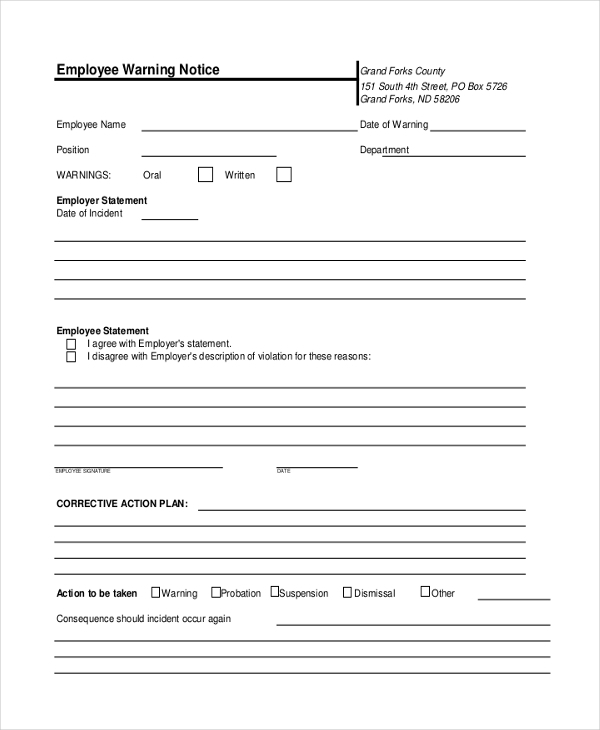 The human resources department of a school to serve notices to teachers can use the school employee warning notices or faculty members can use this form. This form is available in PDF format. You can also see Notice to Vacate Forms. 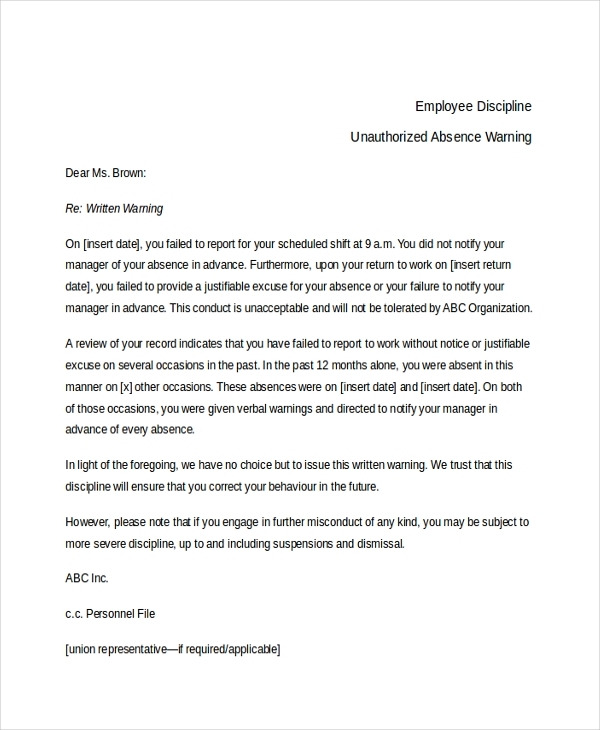 The human resources department of a bank can use the bank employee warning notice to serve a notice to those employees who have displayed poor conduct. The form is available in PDF format. Small and medium-sized firms can use the HR employee warning notice. 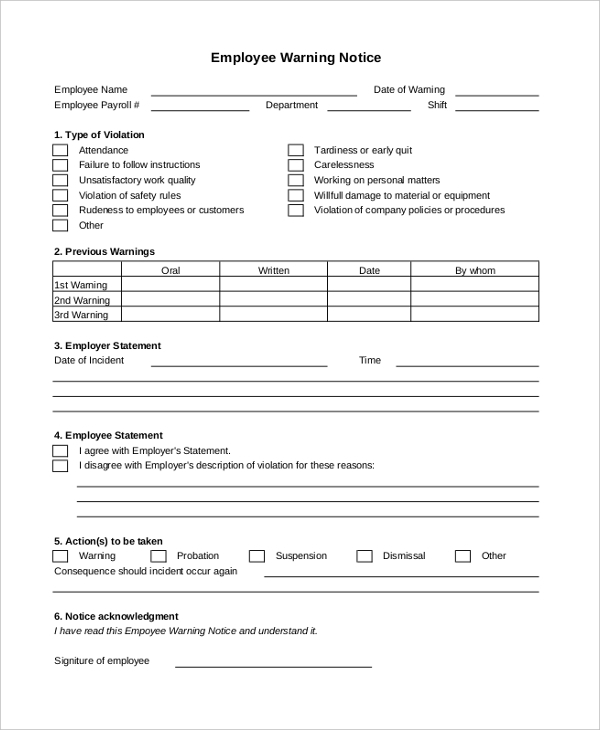 This form has space for the user to add details of the employee, the reason of poor conduct, the signature of the employee and other relevant information. This form is available in PDF format. The form 21 employee warning notice has space for the user to add details of the employee, reason for poor conduct, corrective action plan details, and other relevant information. This form is available in PDF format. You may also see Eviction Notice. Who are The Target Audience For The Sample Employee Warning Notice? Firms and organizations of all types and sizes can use the sample employee warning notice. Typically the employers or management of any company that needs to serve a warning notice to an employee of the same company will find these templates extremely useful. Some examples of organizations and institutions that can use these sample notices include banks, schools, restaurants, small sized corporate firms, multinational organizations and various others. The forms are best suited to be used by employers, HR managers, managements, and bosses who require giving a warning to employees for poor conduct. You can also see Eviction Notice Forms. 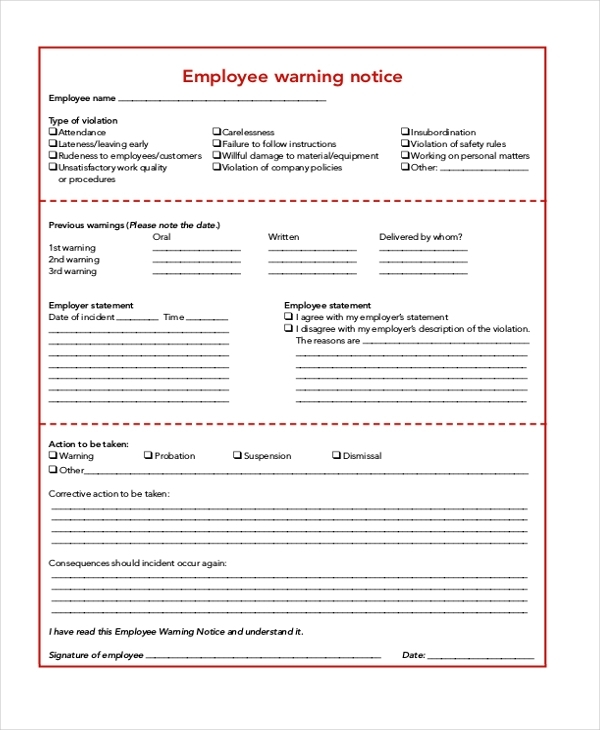 What Are The Benefits Of Using The Sample Employee Warning Notices? The sample employee warning notices are extremely beneficial for multiple reasons. First and foremost they are absolutely free of cost, thus the firm or organization need not spend large sums of money on getting a lawyer or professional to draft them. Secondly, these forms are also extremely useful because of they are ready to use the feature, convenient formats and also because they can be saved and re-used multiple times. 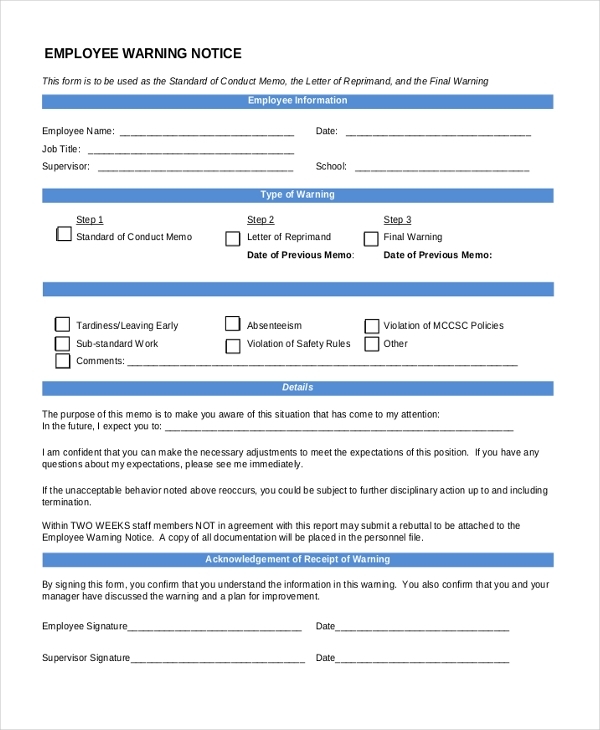 Lastly, the forms are also extremely useful because they can be easily printed and given to the concerned employee or even emailed and sent to him. Thus, these sample employee-warning forms have a variety of benefits. You may also see 30-Day Notice to Landlord Forms. So, if you’re looking for a professionally drafted sample-warning letter, you needn’t look any further. Just download from the above-mentioned list any of the letters that best suit your requirements, edit them, add necessary information to them and print. You will find this sample warning notices extremely useful and convenient.